It's Day 15 of my series, "A Month of Autumn Wartime Recipes & Food," and I'm halfway through! I love a lot about this ad. 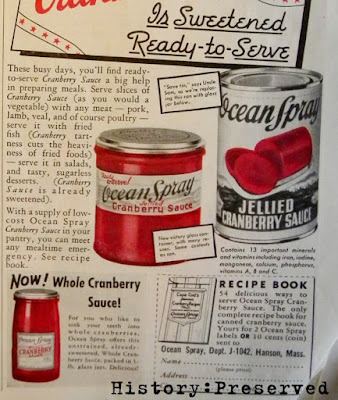 For instance, it tells you how to use the cranberry sauce: "Serve slices of Cranberry Sauce (as you would a vegetable) with any meat..." haha! I guess if it's in such a strange form (like a log! ), you'd need to know what the heck to do with it. I also love the text in the small boxes about saving tin: "'Save tin,' says Uncle Sam, so we're replacing this can with glass jar below." and "New victory glass container, with many reuses. Same contents as can." Not only were they emphasizing their part in the war effort by saving tin, but they're encouraging you to reuse the jar. Cool! This is also one of those products that was pre-sweetened, so by using it, you would have saved on your sugar ration. 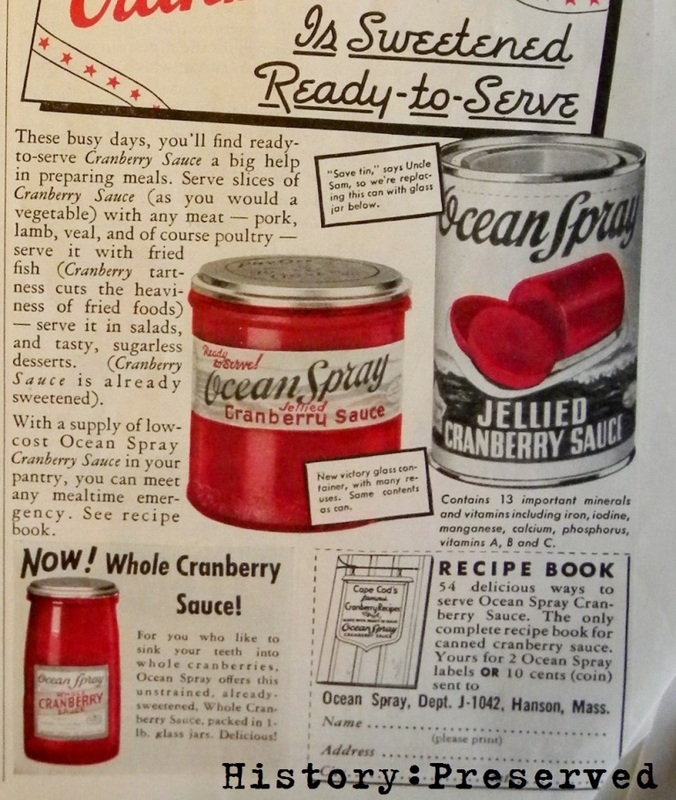 I think I kind of want some cranberry sauce now. Yum! I love this one! It's so fascinating to see what ploys advertising used. There's so much to learn from it!